There’s an interesting bit of information available this morning courtesy a recent lakefront sale. 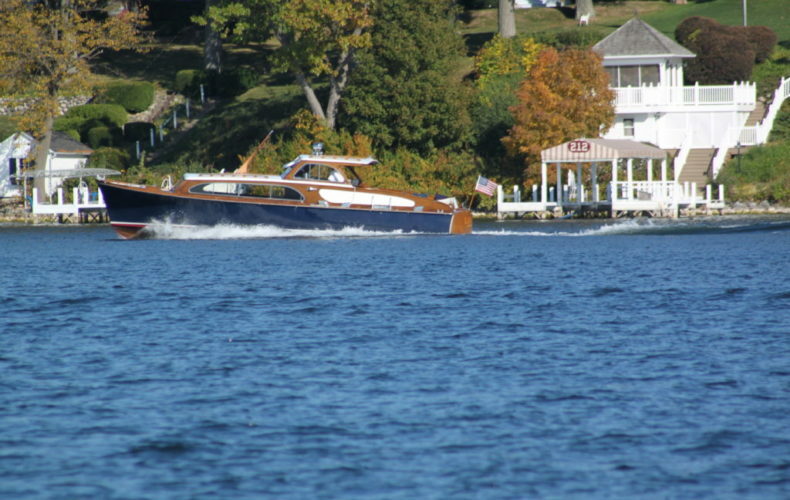 The sale was of an older house on a 90′ lakefront lot in the Birches. The property was fine. The MLS description made no mention of it, but I believe the house may have been a Zook. Zook homes are a lot like Frank Lloyd Wright homes, in that the sellers care about the pedigree of the architect, but the market doesn’t. This property was initially listed for $3.5MM back in 2008, and after a series of price reductions and listing pauses, the property mercifully sold this week for $2.3MM. I didn’t have the listing or the buy side, which is pretty awful for me but worse for the buyer and seller. The parcel of land was reasonably decent, though I don’t count Maple Lane to be among the best streets on the lake. It’s a fine street with fine homes, but it’s not necessarily a street that has a history of selling for elevated prices. Today isn’t about that parcel, it’s about the market context of this sale. Brokers are clamoring over potential listings to such an extent that prices are being driven up less by market conditions and more by the breathlessness of agents who are new enough to the business that they have no way to be sure of valuations. It’s not their fault, they’re just chasing dollars. To understand what this sale means to the market we must first look back at some very recent history. In 2016 I sold three lakefront homes on Lackey Lane. Of those three, two were modest homes, one of which has since been torn down while the other was renovated. Those two properties that sold at land value printed at $1.9MM and change, for 100′ lots on a really desirable street. Geographically, Lackey and Maple are close, so we’ll consider them to be likely comparables for each other, even though I find Lackey to be far more appealing. Those two sales printed at around $19,000 per front foot. This isn’t some long ago number, this is 24 months ago. Market conditions today have improved, but market conditions in 2016 were still quite good. The recent sale on Maple printed at $25,555 per front foot. The overall land mass at Maple was larger than Lackey by two fold, but the market pays little attention to overall mass and focuses instead, perhaps at times incorrectly, on frontage. The Maple sale closed 34% higher than the 2016 sales on Lackey. Does this mean the lakefront market has appreciated 34% in the past 24 months? Of course not. Does it mean that some properties have appreciated that much in such a short period of time? Absolutely yes. In 2016, those Lackey sales were not easy sales. Both properties endured some time on market. Both properties were overlooked, even by smart buyers who were working with me. Today, the Maple property proves out what I knew then: 100′ vacant lots that are selling at land value are becoming increasingly rare. Just as we’ll someday run out of dumpy lakefront cottages that you might be able to buy for $1.2MM, we’re also running out of 100′ lakefront lots with older, modest homes on them. This scarcity is driving up prices in both categories, though the entry level market remains rather stagnant compared to the 100′ market. Expect this trend to continue as buyers seek out properties that offer them some upward mobility should they one day decide to build new, or undertake a serious renovation. Several of our vacation home segments finished 2017 without a particular narrative. They were nice markets that had a nice year. Nothing more, nothing less. No major breakthroughs, no particular oddities. The other markets have been on a roll, and we have no choice but to pat them on the back and tell them they did well. The lakefront market, too, had a nice year. It built on volume and built on price as inventory disappeared. But this is where the lakefront market says goodbye to the other markets and wishes them well. The lakefront market is on to bigger and better things. The lakefront market has a different story to tell. That story, in case you’re new to this blog or new to the Lake Geneva media mentions, is a dramatic increase in upper bracket sales activity. This is the story that needs to be told. This is the difference between Lake Geneva and all other Midwestern vacation home markets. If this sounds like a common refrain coming from this site, that’s because the refrain is historically rare and is worthy of this praise. Consider the prior market peak. That peak was between January of 2007 and January of 2009. During those months the lakefront market on Geneva printed three sales in excess of $4MM. The top sale for that period closed for $4.95MM. Now consider the current market cycle and the sales that have occurred between January 2016 and January 2018. For those 24 months, the lakefront market printed 10 sales in excess of $4MM and three sales over $7MM. The top sale was $9.95MM. For my part, I represented either the buyer or seller in seven of those ten sales, and each of the top three sales. Currently we have five more properties pending sale over $4MM and one pending sale over $12MM. This is no longer a market that struggles to provide one or two sales over $4MM annually. That’s the old Lake Geneva, and this is the new Lake Geneva. Increased upper bracket activity, a stronger overall buyer, and a top end that has been completely and thoroughly redefined. While there are questions about the long term strength of this particular segment, I think there is one nagging question that has been answered. 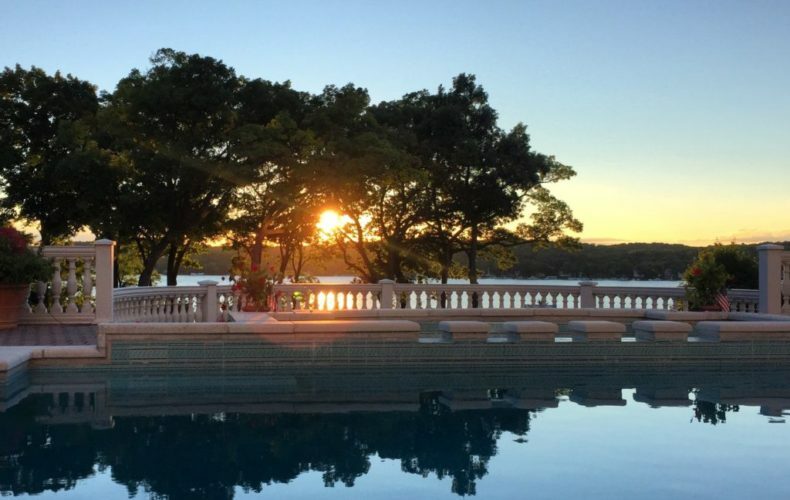 Can Lake Geneva provide liquidity to owners who have homes justifiably valued in the $10-15MM range? Yes. 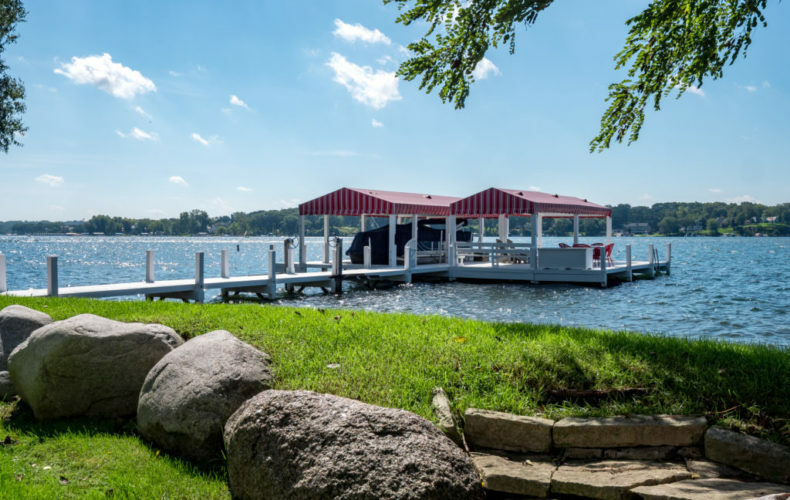 A follow up question with more devastating results: Are buyers buying lakefront houses for too much money, in part because they don’t seek qualified counsel in the decision? Also yes. For the year just ended the lakefront market closed 26 single family properties (MLS). These sales registered $27,578 per front foot, up a bit from the $27, 193 from 2016. In total we sold 2455 front feet on Geneva, down from the 2882 front feet sold in 2016. I’m finding the traditional price per front foot metric to be increasingly antiquated, even though the market still likes to point to that number as the best and easiest way to identify value. I’ve started to add in a price per square foot of structure ($560.96) and price per square foot of land ($58.09) so that buyers have additional means by which to understand the value of a particular property. There is no particular means to measure value, but these three metrics combined with nuanced understanding of desirable locations and attributes can help narrow down the valuation range. Entry level lakefront traded with some vigor in 2017, and I did find it curious that this segment offered strong value even as the broad market accelerated. Five lakefronts traded under $1.325MM last year, including two under $926k. Those sales represented a nice entry point into this lakefront scene, and I continue to believe that we will find ourselves in a position where the market runs out of sub $1MM homes. 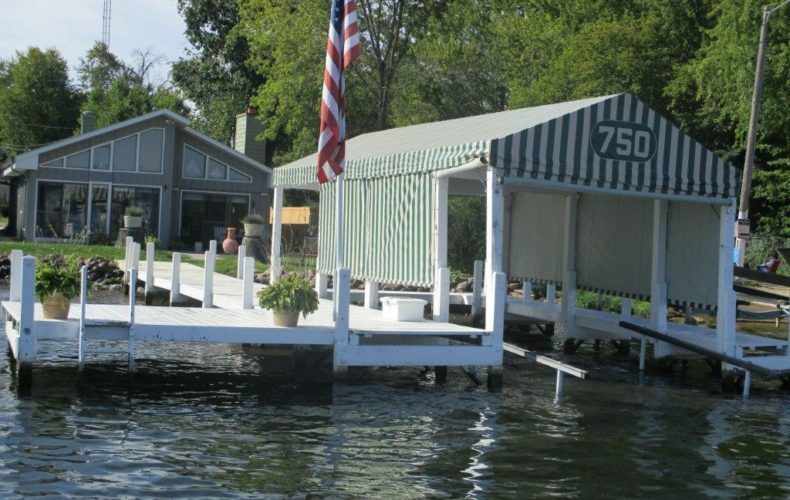 These sort of basic cottages only exist on the lake is certain areas, and with each sale these are properties that are typically transformed via renovation or reconstruction. 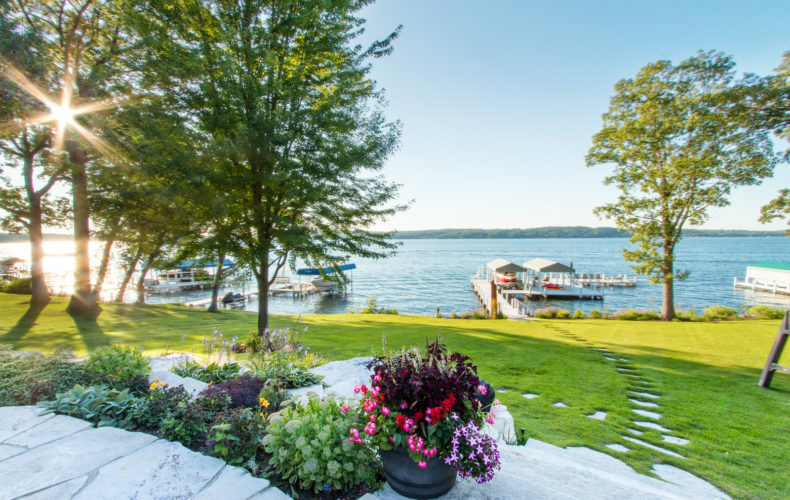 If you’re an entry level lakefront buyer, you’d be wise to move on properties and not miss out on purchases over small negotiation points and percentages. The story for 2018 will be inventory. 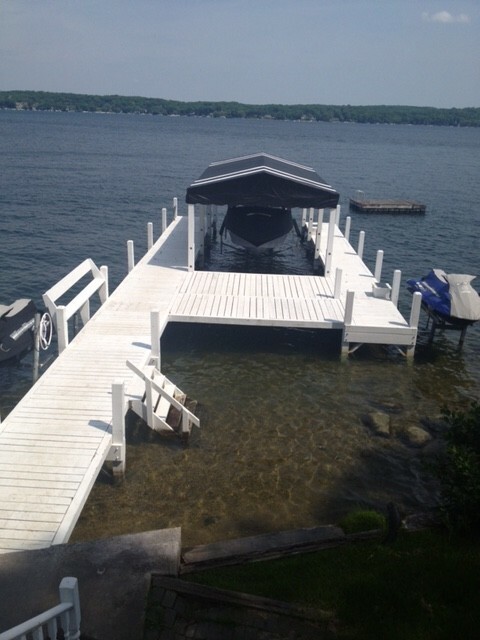 Today, there are just ten Geneva lakefront homes available (private frontage, without offer). If the stock market maintains this incredible level (note, it doesn’t need to keep moving higher, just not correct significantly), Geneva will see another terrific year. Heck, the way buyers are buying in January, maybe we don’t even care about the stock market anymore. New construction is rampant at the moment, and while the upper end values currently support these builds, it’ll be interesting to see if this upper bracket market hits resistance in the coming years. For now, expect inventory to remain low, and cary-over sales from 2017 to close during the first quarter 2018. The market is clamoring for inventory in each segment, including that lofty $6MM+ range. New construction in any price segment will be of interest to current buyers, so long as the parcels match up with the price. That’s a key. I’m expecting inventory to build over the coming months, as opportunistic sellers see a market rife with activity. Some brokers are telling sellers to name their price, but that’s ridiculous. The market is hot, but buyers and sellers still need to understand basic fundamentals of market valuations. If you want an agent to tell you every house is the right house, then I’m not your guy. If you want an agent to help guide you through this increasingly active and competitive market, I’m here to help. In real estate, being shameless is quite important. I’ve struggled with this at times, most of the time, really. But I still tell you I’m this and I tell you I’m that, because if I don’t, no one will. But I’ve only developed some shamelessness when there was something to actually be proud of. Too proud, perhaps. The new market has generated so much shamelessness that you’d think everyone was the top agent. Lakefront Specialist, that’s a common email tag. Lakefront Pro. Some opt for the shorter version, lest they spell specialist wrong. And others still, “The Most Powerful”. This is more like a Master’s Of the Universe theme, but in 2017, all of it has been adopted by my competition. It’s a bit dizzying. The market appears to me today to be absolutely ladened with buyers. I say appears to me, because it’s impossible to know exactly what buyers are truly active and which buyers are just looking at properties because it’s 2017 and that’s the thing to do. I would guess there are more buyers in the market today than at any single point in the past 20 years. Yes, that’s a serious claim. But it’s likely accurate. The smart ones are working with me, the others are working with the various and assorted Specialists that have very recently self-assigned that title. Yet for all of these buyers, the market is still a Wisconsin market. We are still Midwesterners. And so we watch and we wait and we look for the right thing. Contrary to what your Specialist may tell you, the right thing is not always whatever was just listed. 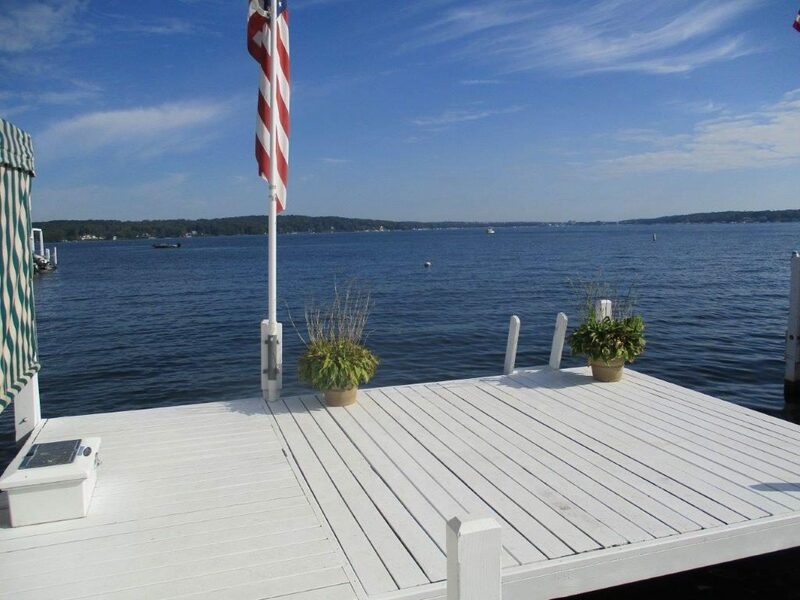 This morning, there are just 22 lakefront homes available for sale on Geneva Lake. This includes the Trinke’s house that’s really just Trinke’s frontage, but we’ll add it in because we’re desperate for inventory. Beyond those 22, there are others pending sale. A listing on Main Street in Lake Geneva in the mid $2s is soon to close. It should be noted that another lakefront in that area was under contract but has since returned to market. My marvelous listing on Jerseyhurst is under contract with a fall closing scheduled. A listing on the South Shore in the mid $2s is pending. And a small entry level lakefront in Fontana listed at $1.475MM is pending this morning. That’s a decent amount of activity, but it is not commensurate with the buyer activity on the lake. There are several reasons for this. First, and perhaps most damning, is the absence of reasonable sellers. Note I say reasonable. The market is hot. Everyone knows this. Even your newly minted Lakefront Specialist knows it. Sellers know it, too, and they’re attempting to capitalize on it. Sellers are listing aggressively, and we cannot blame them. But what we can do is blame them when they receive solid offers within mere percentage points of their bottom line and they choose to walk. This is foolish behavior. Sadly, this is the behavior many sellers have chosen to display. Perhaps the market run will continue long enough to prove them right, but perhaps their 2017 confidence is just a touch too much. The inventory that deserves your consideration is both the new bits that have been trickling to market, but mostly the aged pieces of our market. 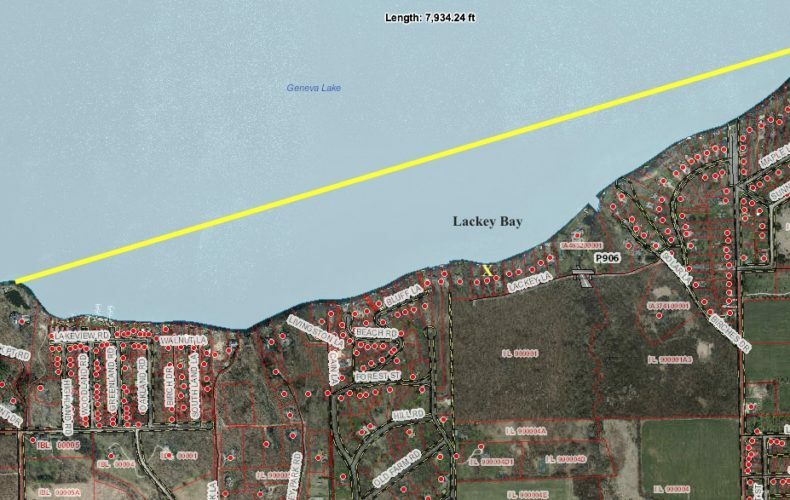 If there’s a new lakefront for $3MM, guess what? You’re going to have to go for it quickly or someone else is going to buy it. That’s just the nature of this market. But if there’s a $3.5MM listing that’s been dying on the market for a year or two, isn’t this the sort of property we should be gunning for? I believe the answer is yes. Your Lakefront Specialist is reading this, furiously scribbling down notes, and he/she concurs. So what comes next? What do we do with the rest of this superfluously soggy summer? If we’re a buyer, we remain vigilant. We look for new inventory. We align ourselves with the only top agent in this market (spoiler- it’s me). We don’t chase every golf course hushed rumor down the rabbit hole. We don’t reach out to the new Lakefront Specialist. We just watch and we wait and when something looks right we take a run at it. If we’re a currently listed seller, then we look at this market through a different lens. We consider our position in the market. We reduce if we haven’t had any offers in months, years. We look to position our property in the perfect light, with a hefty consideration for reality. And if we’re a lakefront owner considering selling, this is the easy part. We reach out to Dave Curry. Above, my new Elgin Club lakefront listing. $1.975MM. The thing about entry level lakefront is that it’s entry level lakefront. It’s not fancy. If it were fancy, it wouldn’t be entry level. 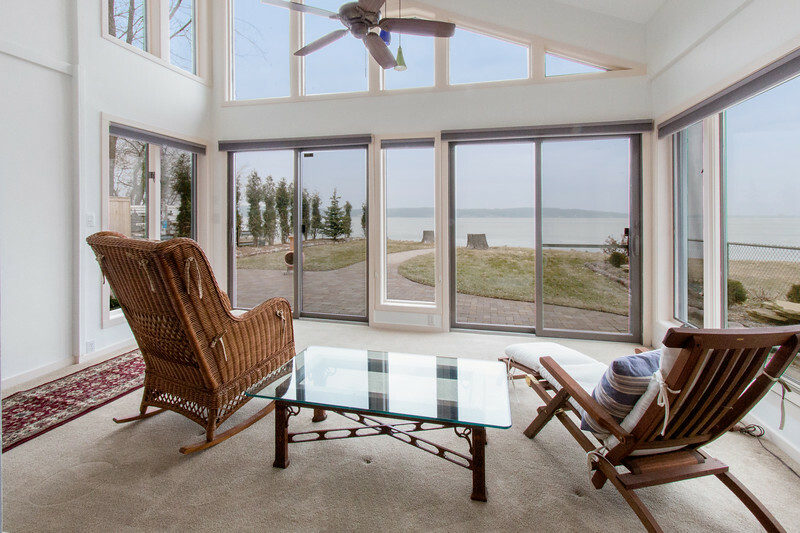 Entry level exists in increasingly fewer locations on Geneva Lake, due largely to the fact that often times buyers of entry level lakefronts transform those once modest, affordable homes, into something entirely different. If you’re a buyer for an entry level lakefront, this generally means you’re on the hunt for something priced below $1.5MM. In that segment, there are things you can expect but mostly things you shouldn’t expect. Like garages and level frontage. Entry level buyers rarely have a chance to buy those. W3298 Park Drive in Linn Township isn’t going to win any design competitions. It’s a nice house, with nice enough things, but fancy it is not. There’s a concrete driveway, fresh landscaping, and a beautiful lakeside paver patio. There’s a terrific H-slip pier, traditional and sturdy. There’s some new siding and a newer-ish kitchen and three bedrooms and two baths. There’s plenty to like. But the rare bits are not those bedrooms or the bathrooms or the stack washer/dryer in the hallway closet. The rare bit, if we’re looking for entry level lakefront, is the 60 feet of dead level frontage and the existence of a two car garage. These are, in the context of entry level lakefront homes, among the most rare amenities. The house should sell rather quickly in this current market. The renovation of this house, should a buyer choose to improve upon what it is today, would be fairly painless. It’s a simple house without a lot of moving parts. The layout is normal, which, if you’ve looked at entry level lakefront homes for some amount of time, you’ll recognize as being unique for its plainness. There are no spiral staircases here. There are no rooms that you’re not sure what to do with. There’s nothing here that doesn’t make sense. 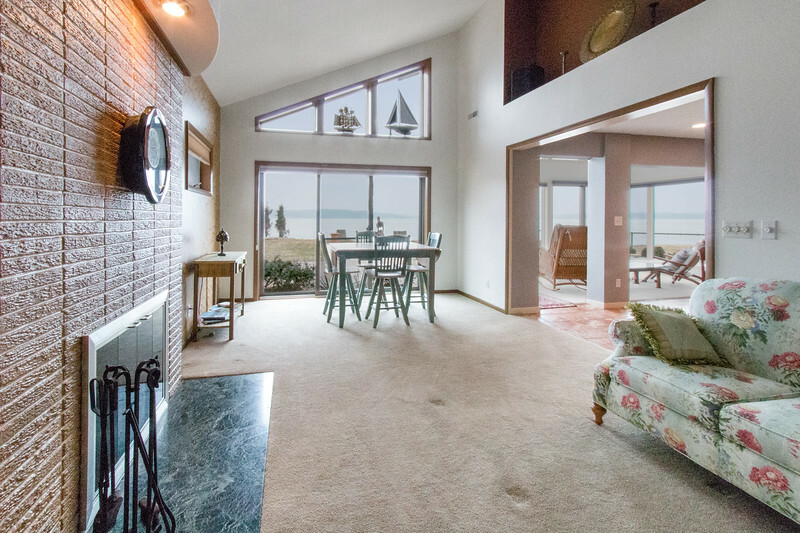 It’s just a house with a big garage and a completely level lot, with 60 feet touching Geneva Lake. The views, as an aside, are among the best on this lake. Facing towards the City of Lake Geneva, the lake here is wide and round, lovely. If you’d like to tour this home, just let me know. But if you do want to see it, you should probably do so sooner rather than later.